If your business has a high speed fibre connection then failing over to a slow connection can be a real productivity killer. Enter fixed wireless broadband – a high speed, cost effective failover solution for fibre services. 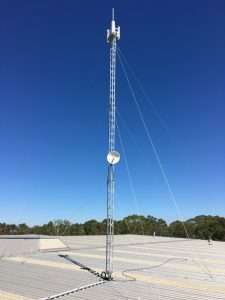 Unlike fibre, fixed wireless offers your business a diverse path not affected by the cables in the ground or on power poles. The Summit fixed wireless network is fed by a diverse fibre feed – this means that it’s even more reliable than a single fibre connection. If we lose a single fibre feed, we intelligently will route your traffic to another point within our extensive fixed wireless network to where we have other fibre backhaul. With over 3Gbps of fibre backhaul just on our fixed wireless network alone, you’ll be guaranteed a fast connection every time. To find our more about how you can add a cost effective fail over connection to your business, speak to us today on 1300 049 749. Say goodbye to using ISDN and PSTN phone lines forever. How the cloud can benefit your business. An efficient and effective business phone line service is key to your business staying competitive and making a profit. But with all the technical jargon and acronyms it can be hard to work out which business phone line service is right for your business. And while there are ISDN and PSTN phone line options to consider, there’s another solution you may not have thought about – the cloud! What is the difference between ISDN and PSTN? ISDN stands for the Integrated Services Digital Network, a digital network technology that carries and transmits voice, data, video and fax in a digital format. In Australia, ISDN services can either be a basic rate service, known as ISDN 2 or a primary rate service, known as ISDN 10/20/30. ISDN2 (BRI – Basic Rate Interface) is the entry-level version and has two 64 kbit/s voice channels and one 16 kbit/s signalling channel that add up to 144 kbit/s. ISDN10/20/30 (PRI – Primary Rate Interface) provides users with 10, 20 or 30, 64 kbit/s channels permitting for a maximum data rate of approximately 2 megabits per second (Mbit/s). Medium to large businesses usually use primary rate services. Summit SIP Voice is a business grade voice solution. Suitable for plugging directing to your IP phone system, SIP comes with blocks of 10 lines, 20 lines or 30 lines. Find out more about Summit SIP Voice service here. PSTN stands for Public Switched Telephone Network lines. With this dedicated service, each line has a unique phone number with the area code of its assigned telephone exchange. Despite the core network being almost entirely digital, PSTN is delivered to the premises via twisted copper pairs in analogue form. While business phone line services using PSTN are similar in function to residential landlines, they are managed on less congested networks. Even though many businesses are still using PSTN as their business phone line service, there are limitations. If your business is growing, your office will need to have more than one PSTN line. Installing multiple PSTN lines can become very expensive. As the NBN network is driving a switch from copper based voice services to services that run over broadband & data services, over the next 2-4 years PSTN & SDN will be phased out. This means that traditional PSTN & ISDN users will be forced into switching to alternative VoIP based voice services. If you want to keep your PSTN Phone numbers, you will have no choice but to move to VoIP based service to replace your old voice lines. Legacy PBX hardware will need to be replaced as PBX systems will need to be compatible with IP based voice services, or a cloud based phone solution. Now you know the difference between ISDN and PSTN, it’s time to discover a more powerful, simple and intuitive business phone solution! When your business uses the cloud as a phone solution, you can forget about the technical jargon and acronyms. No more expensive line rental! Your business also gets the latest equipment, maintenance and customer support from a local service centre. Find out how moving away from ISDN and PSTN to the cloud can benefit your business. Talk to our friendly and helpful Summit Team Members on 1300 049 749. If your business uses PSTN or ISDN for its phone system, it’s time to consider a more efficient and cost effective business phone system. Did you know that no matter how small or big your business is, a cloud based phone system may be a better option? But like anything business telecommunications, it can feel confusing. So here’s the facts about cloud based phone systems for business. For the last few years, cloud based phone systems have been heralded as the ‘white knight’ of business communications. But outside of all the headlines and hype, it’s important to know how a cloud based phone system can save your business money. Because a cloud based phone system doesn’t use traditional phone lines, there are no line rental fees – making it more cost effective than traditional landlines. And with no need for expensive outlays on PBX systems, the cost savings continue! When you combine the cost savings with efficient call functionality that’s delivered through the cloud, is it any wonder that cloud based phone systems for business is increasing in popularity? Did you know that as the NBN network is driving a switch from copper based voice services to services that run over data and broadband services, PSTN and ISDN will be phased out over the next 2-4 years? This means that business who use traditional PSTN and ISDN will be forced into switching to different VoIP based voice services. And if your business has legacy PBX hardware it will need to be replaced so your PBX system is compatible with a cloud based phone solution or IP based voice services. Summit Business Cloud Phone Solution eliminates the need to purchase and maintain PBX hardware. And with business-grade call features and no central hardware, your phones can be connected at any location and unified into an organisation-wide phone service. Got a business with multiple offices or have employees who work remotely? Talk to our friendly and helpful Summit Internet Consultants and find out how our virtual PBX can benefit you. Call us 1300 049 749 today. Our cloud based phone systems offer functionality and options for businesses that want to cut costs while getting the best features available. From a start-up with a two-line cloud based system to a business that is growing and has multiple locations. Our cloud based phone systems easily and efficiently grows with you. And with Summit’s FlexPBX Max, your business phone cloud technology will always work for you. Say goodbye to expensive repair bills and frustrating overseas call centres. If any of your handsets or equipment suffers a failure, we’ll replace it at no additional cost to your business. Call our friendly and helpful Summit Team Members on 1300 049 749 today. Are you a business using FreshTel for Voice Over IP? If so, You’ve got less than 30 days to move your phone numbers away from FreshTel before they disconnect your service. Earlier this year, VoIP Provider FreshTel announced that they would be ceasing operation of their VoIP services as of 30th June 2018. How can Summit Internet help? Move to a Summit SIP Trunk or Hosted Phone System and we’ll transfer your phone number for free! Avoid the last minute rush and avoid your business being disconnected. To discuss how Summit can help you transition from FreshTel, please contact one of our Team Members on 1300 049 749. At Summit, we’re making it easy to bring your current Yealink handset to FlexPBX so that moving from another provider is a streamlined process. Simply select from our FlexPBX Pay as you Go (PAYG) plan or FlexPBX Max plan and we’ll hook your current Yealink handset up at no extra charge. Whether your current handset is a Yealink IP Phone, Polycom IP Phone, Grandstream IP Phone, Cisco IP Phone, Snom IP Phone or Aastra IP Phone, we can streamline the move from your current provider with our FlexPBX automatic provisioning templates. Our team are experts in telephone system migrations. Our project management team will move you from your existing system in record time all with keeping you on the air. If you have an IP Handset not listed and would like us to certify it for use on FlexPBX, simply contact our team on 1300 049 749 and our team will arrange certification. At Summit, we’re making it easy to bring your current Polycom handset to FlexPBX so that moving from another provider is a streamlined process. Simply select from our FlexPBX Pay as you Go (PAYG) plan or FlexPBX Max plan and we’ll hook your current Polycom handset up at no extra charge. Doncaster Road speed limit increased!